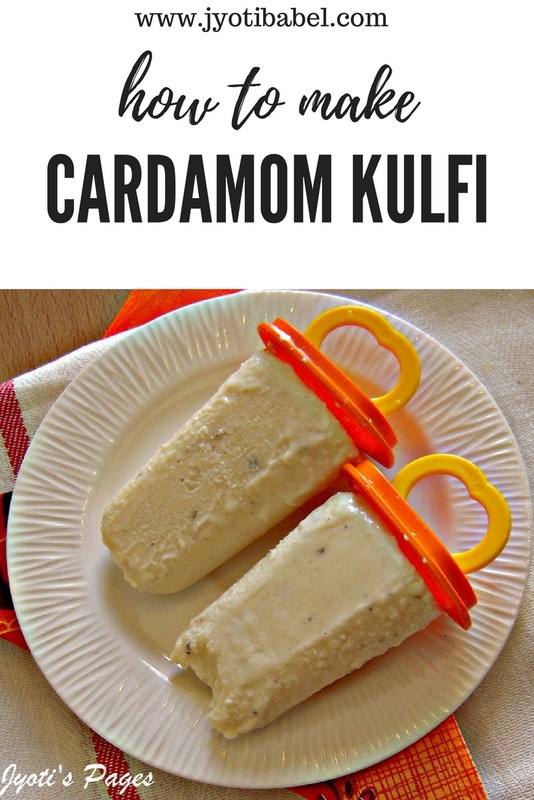 Cardamom Kulfi is the traditional Indian popsicle made with evaporated milk and is flavoured with cardamom. It is a painstaking process since it involves constant stirring of the milk on low flame, but it is so worth it. It is very popular in India. People indulge in kulfi to beat the heat in summer months. Kulfis can be made in many flavours. The one I am sharing today is cardamom flavoured. As a child, I always relished the homemade kulfi my mother made during summer months. 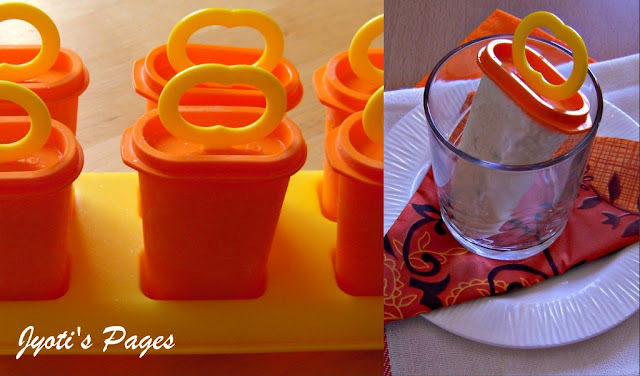 I bought these kulfi moulds on my last trip to India and so I will be flaunting them in my future posts as I have collected some recipes of kulfi to try this summer. The first recipe of Kulfi is obviously my mother's. I have tried to stick to her process and recreate the taste and gladly I have succeeded! Yippee! 3 cardamom pod seeds finely powdered. 1 tbsp ground almonds or almond powder. 1. Stir the cornflour in a tablespoon of milk and keep aside. 2. In a non-stick pan, heat the remaining milk. Once it comes to boil turn the heat to medium and simmer it till it reduces to about half in volume (450ml or so). It can take about 25-30 minutes. 3. Add the cardamom powder, almond powder and sugar and stir well. 4. After a minute add the cornflour mixture and stir well. Heat for another 5 minutes stirring all the time. If it gets too thick add 2 tbsp of extra milk and stir. 5. 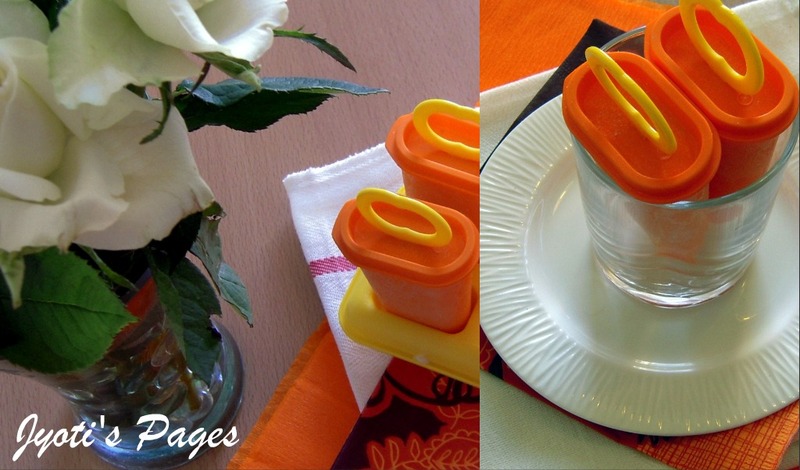 Let it cool down to room temperature and then fill it in the kulfi moulds. 6. Freeze for 6 hours or overnight. 7. Take it 5-10 minutes ahead of serving. Dip it in warm water and unmould. Ready to serve. 1. Variety of flavours can be added. You can add Saffron and nuts like chopped pistachios, cashews etc. 2. Stirring the milk is very important. If the milk sticks to the bottom and burns it will impart a burned smell to the kulfi which is undesirable. 3. In case of not using a non-stick pan, grease the pan with ghee/clarified butter and continue with the process. Milk will not stick at the bottom. 4. If you do not have kulfi moulds, disposable glasses will work fine too. Very Tempting!!!!! Perfect for Fun in the Sun!!!!! Wow... what a beautiful and tasty treat that is! Loved the creamy - yummy texture..
Kulfi is super tempting.Going to try this soon. Kulfi looks so yumm. Thanks a lot for sending.. The kulfi is looking very exotic..I love cardamom flavour.